Choose your favorite Nostalgia cotton candy flossing sugar flavor to create fluffy cotton candy the whole family will love. 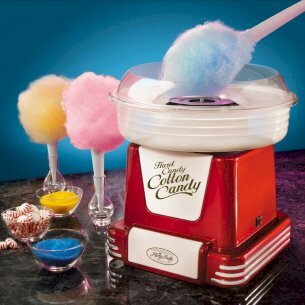 Once preheated, add your favorite candy or flossing sugar to create a wonderful cone of delicious cotton candy. Unit comes with 2 reusable plastic cones, 1 sugar scoop and 1 specialty extractor head. Clear Rim Guard allows you to see the cotton candy being made. Unit also disassembles for easy cleaning. 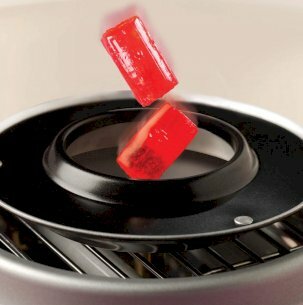 The specialty extractor head is also designed to work with both hard candy and sugar-free hard candy to create a variety of delicious melt-in-your-mouth cotton candy flavors.